Just 13 jobs will be retained at Custom Coaches’ Royal Park site in Adelaide following the sale of the troubled bus manufacturer to a consortium led by founder and former owner Mark Burgess and Sydney-based specialist funds manager Allegro Funds. The new company operating the business is Custom Bus Australia Pty Ltd., and Burgess and Allegro Funds, which are investing in it as separate entities, will retain about 120 staff – 110 of which in Sydney – of the 300 people employed before July, when it went into administration. According to the article on ABC, under the new ownership, the business will operate from its existing Sydney manufacturing base at Villawood and continue to build city and school buses and offer vehicle servicing, repairs and refurbishments, while Adelaide’s Royal will gradually be closed, maintaining the aftermarket business. Scott Bachelor from the Australian Manufacturing Workers Union (AMWU) said 62 workers losing their jobs in Adelaide would have to fight for their entitlements. “From what I understand they will get 70% of their annual and long service [leave], that’s all, they won’t get a redundancy,” he said. Allegro Funds’ partner Adrian Loader has been named Chairman of Custom Bus. “We are pleased that we were able to transact quickly in a distressed situation to ensure this business can continue building the best buses in Australia,” he said. New owner Mr Burgess said he was confident the bus maker had a bright future beyond the current troubled times. “Custom [will have] new and stable Australian ownership with no debt, strong cash reserves and a highly experienced management team backed by institutional investors,” he said. 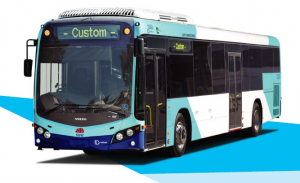 The company, which has bus and coach manufacturing and maintenance facilities in four states, has a contract to supply buses for the Departments of Transport and Education in South Australia.